Whether you need extra security for your pets during car journeys or to allow them safe access to elevated areas, our Travel, Access & Mobility products offer the perfect solution. Ranging from safety and booster seats to ramps and steps, you will find the right product for your furry friend. 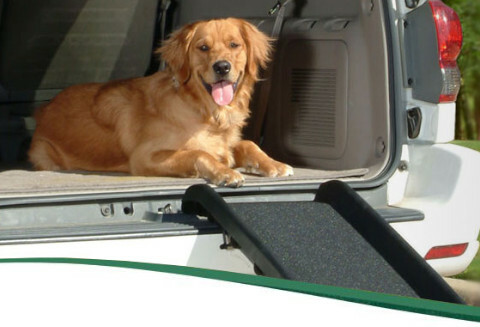 Our great variety of ramps and steps offer easy access to vehicles, furniture or vet tables for your pets - without stressing their joints. Relaxing and safe car journeys are guaranteed with our safety and booster seats. Regular use of ramps and stairs does not only facilitate your everyday life but also reduces stress on your pets’ joints. Reaching raised areas such as cars or sofas has never been easier. With our Travel products you can safely hit the road, together with your furry friend. Our safety seats provide comfort and safety for both of you, so that you can enjoy car journeys together. Help your pets to reach their favourite places. 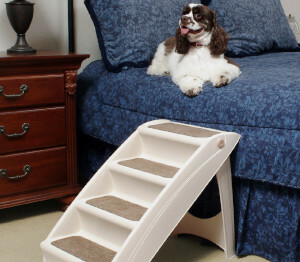 The PUPSTEP Plus pet stairs are an economical way to help pets reach their favourite places. The unique construction of these stairs means they only weigh 2.26 kg but are sturdy enough to support over 90 kg. Built-in safety side rails and non-slip feet help your pet to climb up and down with confidence. The modern design blends in well with any décor and is perfect for reaching elevated spots like sofas or beds and even vehicles. The compact and user-friendly design of the PUPSTEP Plus requires no assembly and simply folds down when not needed.